Ready to fall back in LOVE? The gorgeous deck that captured your heart long ago is still there, hiding under years of dirt and disrepair. Deck restoration can transform your bland, grimy deck back into the showpiece it once was. After you conduct a thorough DIY deck inspection, you’re ready to start upgrading your wooden deck. Here are some of our best deck restoration ideas to get you started! If you’re fairly experienced with doing backyard projects, these tips can be your deck restoration blueprint. 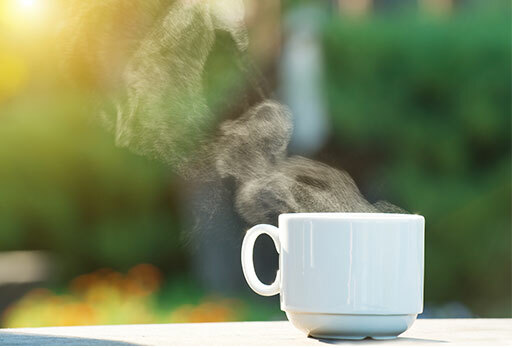 However, at Eby Exteriors, we’re always here to help you bring your deck upgrade dream to reality. One of the most effective deck improvements is the easiest to do as well. 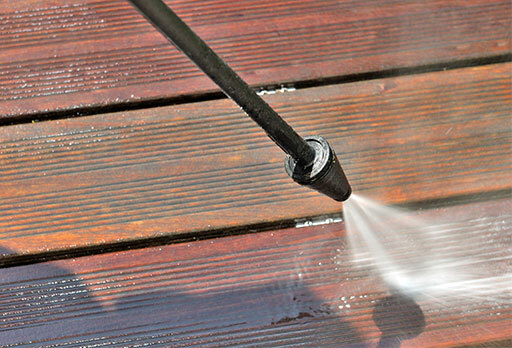 Pressure washing your deck can work wonders by blasting off years of caked-on dirt and grime. While your deck boards won’t look as striking as they did when new, the improvement will be staggering. ALWAYS ask about the maximum safe pressure to use on your deck. Too much power from a pressure washer can actually damage your deck — and that’s the last thing you want to do. Aluminum railing — These sturdy, low maintenance deck rails have a sleek style and come in a variety of shades like black, bronze, white, gray, and sliver. 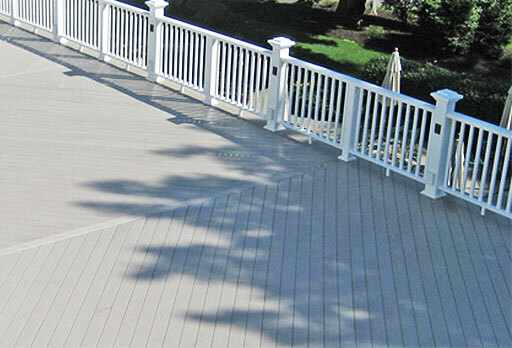 Composite railing — Just like composite decking, composite railing is very low maintenance and looks like painted wood. One of the big reasons wooden decking shows its age is because the deck boards lose their color. While replacing or refinishing your deck is a main component in most deck restoration projects, that can be expensive. If power washing doesn’t help your deck come clean, you can cover the faded board with a large, weatherproof area rug. 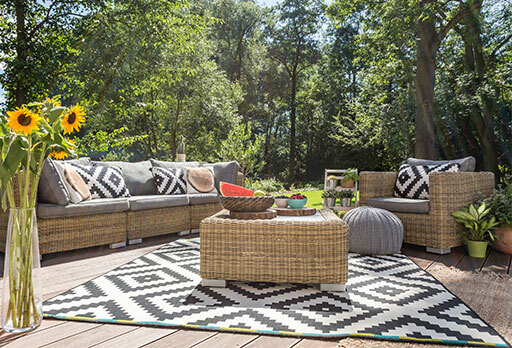 Often made of vinyl, these outdoor area rugs inject a bold splash of color while covering up your old boards. One of the VERY BEST deck upgrade ideas, a drink rail is a deck upgrade built around your railing that is the perfect width for a glass of wine or beer. Include some bar stools and you’ll have the perfect space for entertaining. Adding a drink rail to your old deck can make it feel like a brand new private outdoor bar. Learn more about full-scale outdoor living additions. Not only do patches of mold on your deck make it look old and unpleasant, mold can actually destroy the structural integrity, too. If mold is allowed to grow unchecked, eventually it will infiltrate deep into the boards and destroy them. 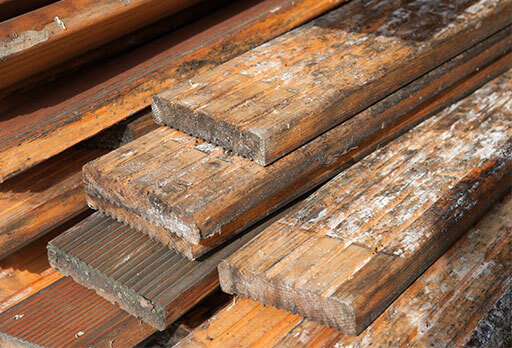 We recommend blasting the mold off with a power washer and treating the affected boards with a diluted bleach mixture. A stylistic touch that pays you back in practicality, creating a new lighting scheme is a fantastic deck upgrade idea. You can choose to embed small accent lighting or install elaborate light fixtures. 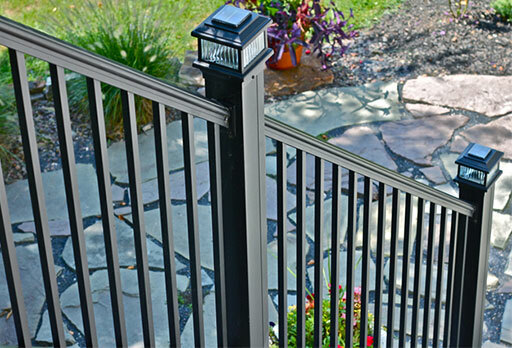 You can embed lighting around the perimeter, flat on your posts, or on the steps. Lighting fixtures are primarily attached to your house or mounted on perimeter posts. Regardless of the design you choose, the glow casts a serene ambiance and allows you to enjoy your deck later into the evenings. One of the primary deck restoration ideas, replacing your drab old deck boards will make your deck look as new as the day you got it. Whether you want to replace them with wooden deck boards or long-lasting, low-maintenance composite boards, you have tons of choices for the fresh look you want. Installing deck boards as part of a deck restoration is a pretty big job, so chances are you’ll need to work with a professional on this one — and we’re more than happy to help. 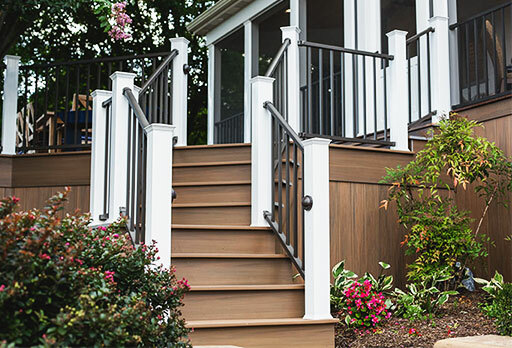 Whether you want to upgrade your dingy old railings — or completely refresh your deck with new boards and a luxurious drink rail, Eby Exteriors is the company to call. After years of doing great work in the Lancaster County area, we have built a reputation as the trustworthy deck restoration and installation team. Whether you know the exact deck restoration upgrades you need or you want to discuss your options, start the conversation today!